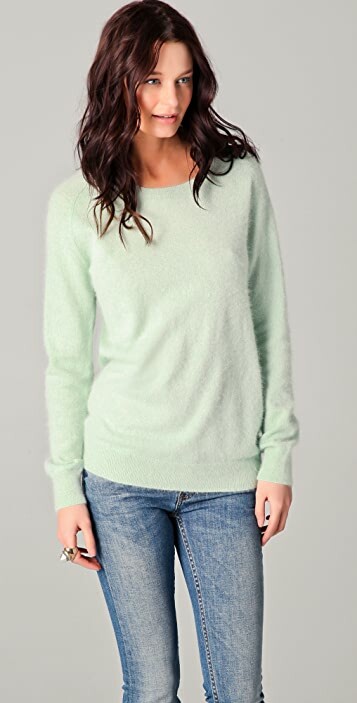 This angora sweater features a scoop neck and ribbed edges. Long sleeves. I love love love the look of this sweater. I wanted to keep it so bad. But, alas, it's just too itchy for that kind of money and after wearing it around the house for an hour or so I got red eyes and hives. Yikes. Guess I'm allergic to angora. Too bad. Beautiful mint color. Medium is true to size. Looks a bit oversized just like pics. Got this today. 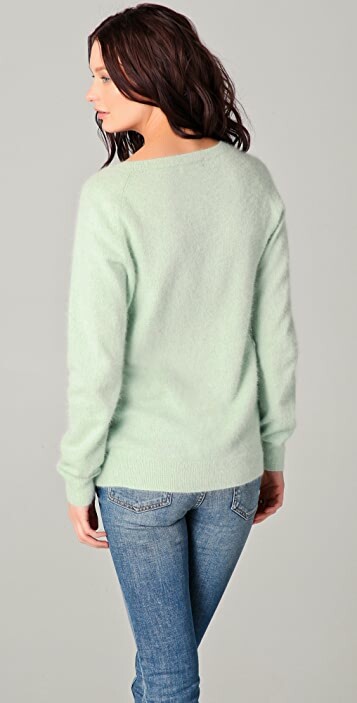 It's a beautiful pastel mint color sweater! As the other people have said already, it is bit itchy but tolerable. Wearing a cami underneath helps if your skin is sensitive. Looks even better than picture. It's not like you see this kind of gorgeous warm pastel mint color everywhere. Highly recommended.I'm about 5'8" and wear size 2 (XS/S)usually. I got this in size M cuz I wanted it a lil more baggier than the one on the model. It was a success! It looked baggier but not extremely baggy. Length hits just below my hip and sleeves are a lil longer than the one that the model is wearing in the picture. This sweater is definitely not form-fitting but not shapeless at the same time. M size was just right for cute girly look that I was aiming for. In sum, get one size up if you want more cute girly look or get your normal size if you want to look like the one in the picture. Took one star off cuz it's a tad itchy but other than that, PERFECT! I think the sweater is as pictured but it it not as soft as I expected . It is scratchy and I have to wear something underneath it to stop my skin being irritated.